Vitamin B3 is comprised of niacin and niacinamide, a water-soluble compound derived from ammonia. Whole grains, fish, green vegetables, meat, milk and yeast contain vitamin B3, which is usually in the same foods as other B vitamins like folic acid, riboflavin and thiamine. Niacinamide is a more water-soluble variation of niacin, yet the two have different nutritional benefits within the body. While niacin has been proven to aid in reducing the risk of heart disease, niacinamide helps to build muscle strength, joint mobility and endurance, among other health benefits. Alzheimer's and Dementia: The nutrient has been shown to stave off dementia, of which Alzheimer's is a subset, and prevent other types of mental deterioration. Arthritis treatment: Scientists have only just begun to look into possibly incorporating the nutrient in treatments for arthritis, but initial results show a beneficial effect. Blood balancing: The nutrient appears to help treat hyperphosphatemia, a condition in which the blood has high levels of phosphates. Researchers are studying a possible correlation between niacinamide and reduced phosphate levels in the blood. Niacinamide also increases the action of medications that lower blood pressure. 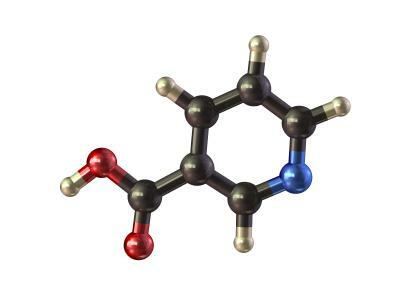 Diabetes resistance: Researchers are studying niacinamide's role in diabetes prevention, but the nutrient appears to stave off the need for insulin and delays the onset of diabetes symptoms. When taken with insulin, the nutrient seems to reduce the needed dosage of insulin. However, the nutrient doesn't control glycemia levels, so should not be used as a substitute for diabetes medication. DNA: The nutrient helps heal broken DNA strands. Headache mitigation: This benefit is hypothetical at best; the theory that niacinamide can reduce headaches is derived from the nutrient's role in generally improving central nervous system functioning and sustaining the lives of neurons. Liver benefits: The nutrient helps in treatment of cirrhosis and other diseases of the liver. This includes healing damage to the liver resulting from alcohol dependence. Natural tranquilizer: The nutrient has a calming effect, and has been used to treat withdrawal from sedatives. Seizures: Preliminary research indicates the nutrient increases the anti-seizure action of prescriptions like carbamazepine, diazepam and sodium valproate. Skin conditions: The nutrient appears in many skin creams, cosmetics and hair products, and seems to help reduce wrinkles, adult acne and rosacea. The benefits come from topical application of niacinamide, rather than ingestion. Researchers are still studying these effects. Laboratory results show the nutrient interacts with estrogen, progesterone and testosterone, but scientists have yet to determine whether the net effect is positive or negative. Safe dosages for children have yet to be determined, and the nutrient has yet to be recommended for those under age 18. May interact with antifungal treatments, but the exact effect is being studied. May increase the risk of toxicity when taken with vitamin supplements that have the potential to cause liver injury. Blood sugar levels in diabetics may increase with excess dosages of the nutrient. Some people develop allergies to the nutrient. Use during pregnancy and breastfeeding isn't recommended because there's still not enough data on safety and effectiveness. Within the first two hours of ingesting, it may cause the face and neck to flush or feel warmth. The effect subsides once the body gets accustomed to the nutrient. A similar pattern occurs with other possible side effects, like headache, heartburn, itching, nausea, tingling and upset stomach. Less likely side effects that go away when the body adjusts include vision problems, rash, swelling, breathing trouble, irregular bowel movements and changes in urinary patterns. Vitamin supplements aren't regulated by the U.S. Food and Drug Administration, so there's no certainty whether any formula claiming to have a certain amount of any specific nutrient actually does. When in doubt, ask your doctor about whether you need to alter your intake of vitamin B3 or niacinamide. Recommended daily allowances list vitamin B3 or niacin instead of niacinamide. Niacinamide is the second of the two components that make up B3. Given that the number of benefits and cautions are roughly equal, it makes sense to get the most authoritative advice possible before changing your diet or vitamin supplement regimen. You may not need to make any changes in your diet to get the benefits of niacinamide, since it appears in so many different foods you're probably eating already.